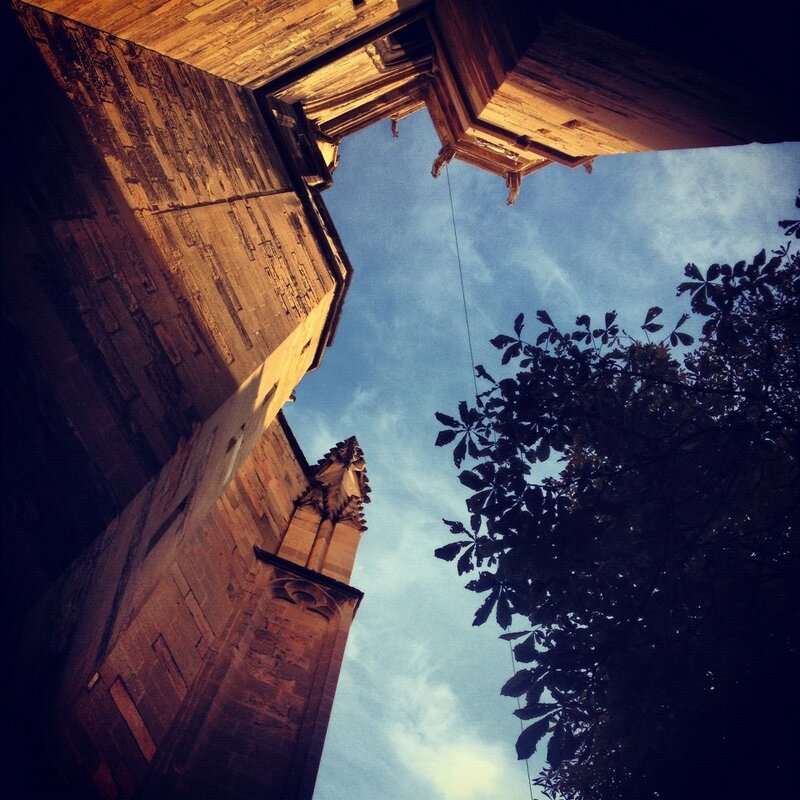 Gareth and I fell in love with Aix-en-Provence, France… and we fell hard. 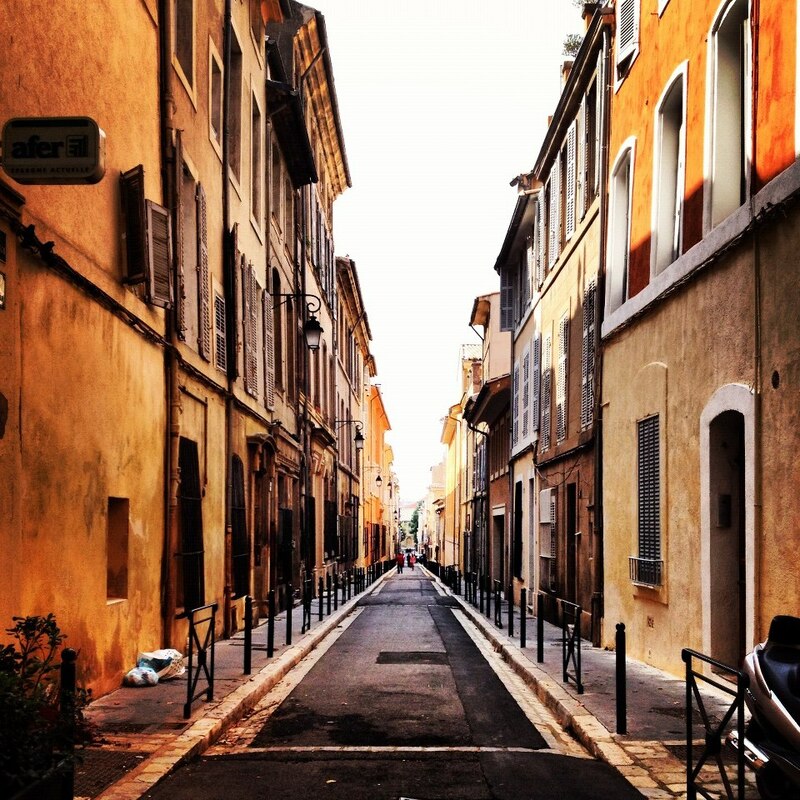 Located in the south of France in the region of Provence, Aix has a warm climate and a laid-back vibe. 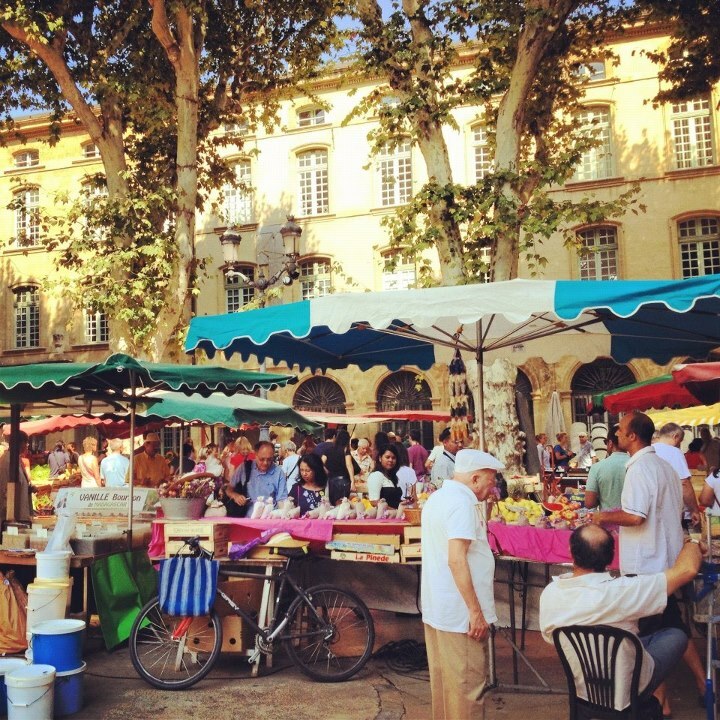 The winding streets are filled with shops, cafés, pubs and outdoor markets. 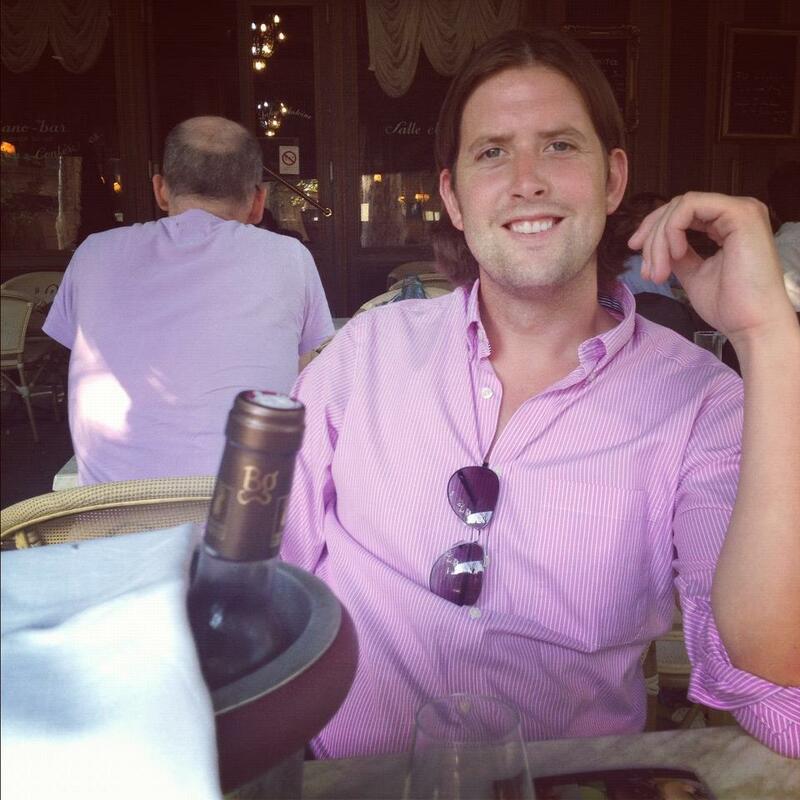 One of our favorite things to do in Aix was to get a bottle of rosé and just sit outside to enjoy the day. 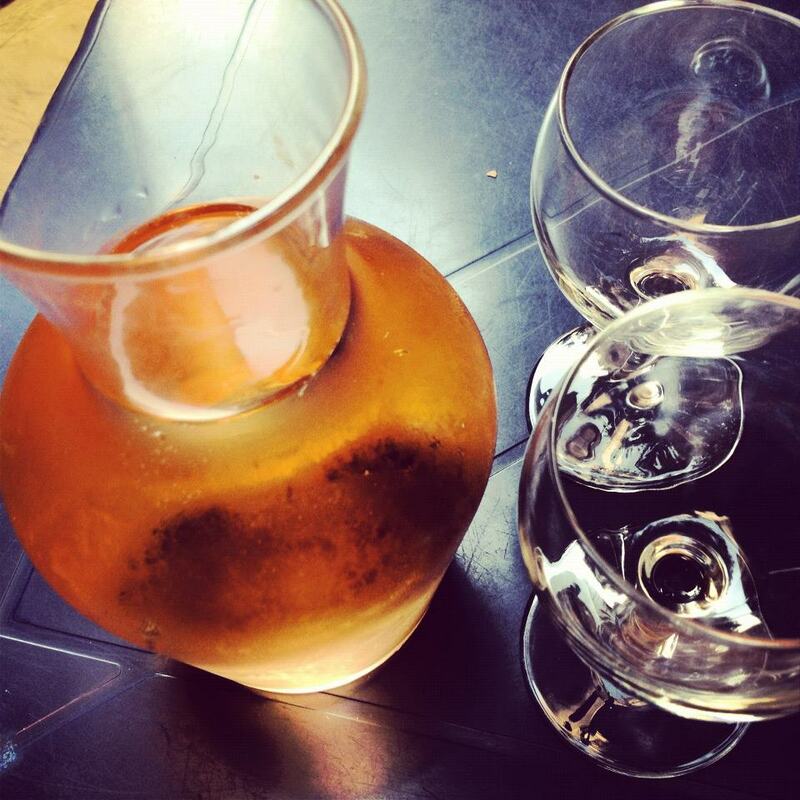 Provence is known for rosé, so it was an affordable and delicious choice. 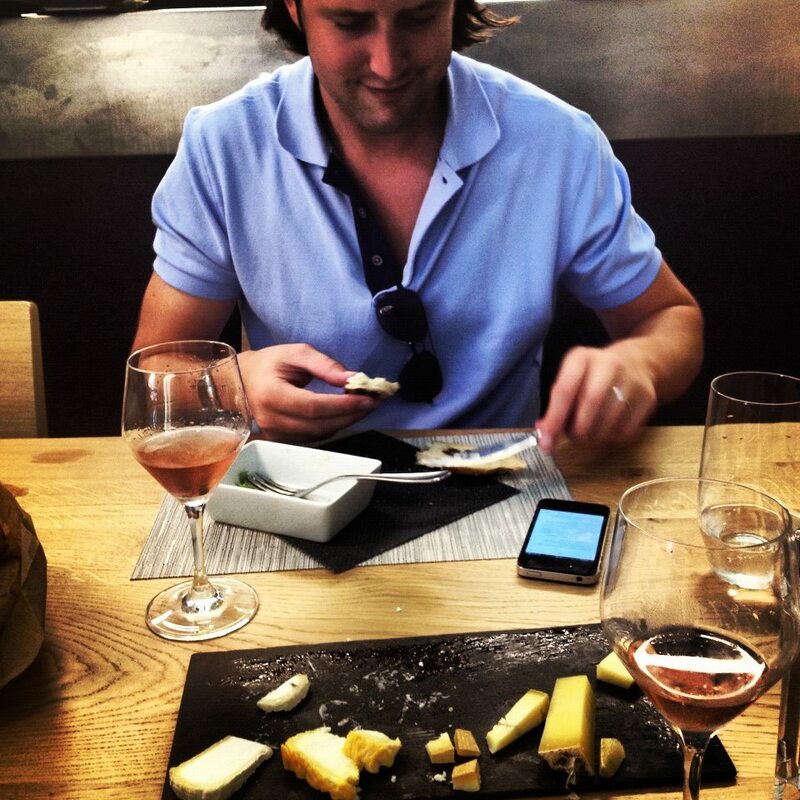 Of course, we also enjoyed the food in Aix, too. 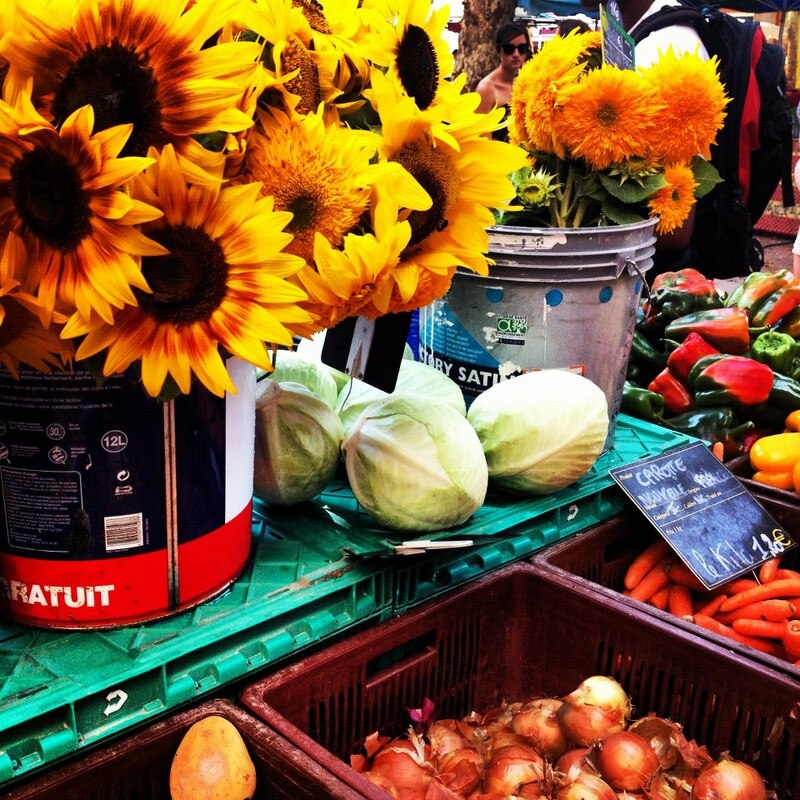 Provençal style cooking has a strong Mediterranean influence and is full of vegetables, fruits, citrus and herbs. All of the meals we had were simple, yet delicious. The ingredients were always fresh and perfectly seasoned. We came across this market as we were walking around the city on our first day there. The market was lively and colorful. 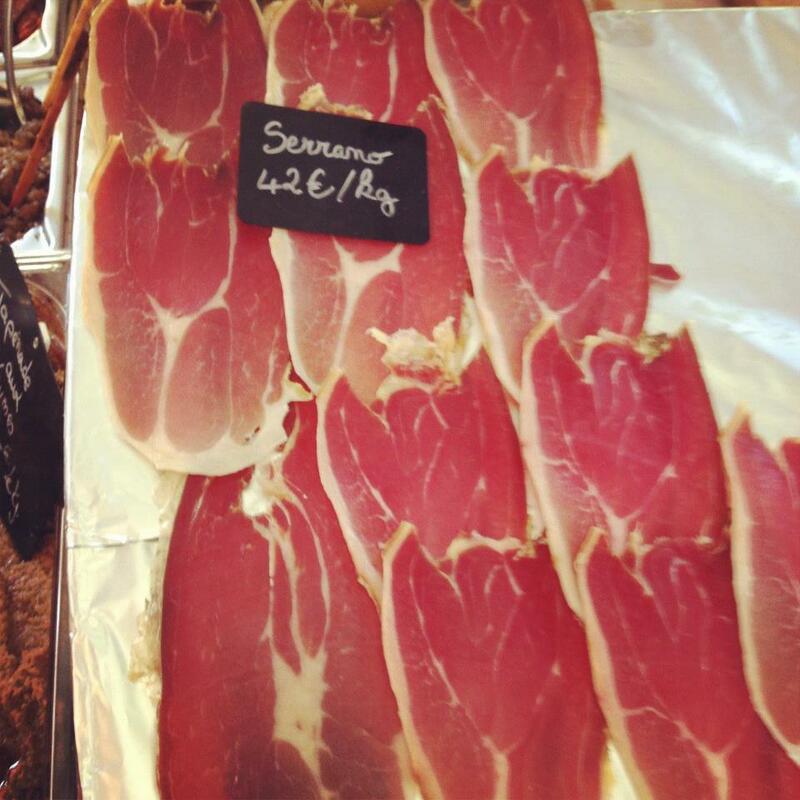 There were so many wonderful things to choose from: flowers, fruits, vegetables, fish, candy, olives, meats and cheese. Naturally, I purchased some olives. 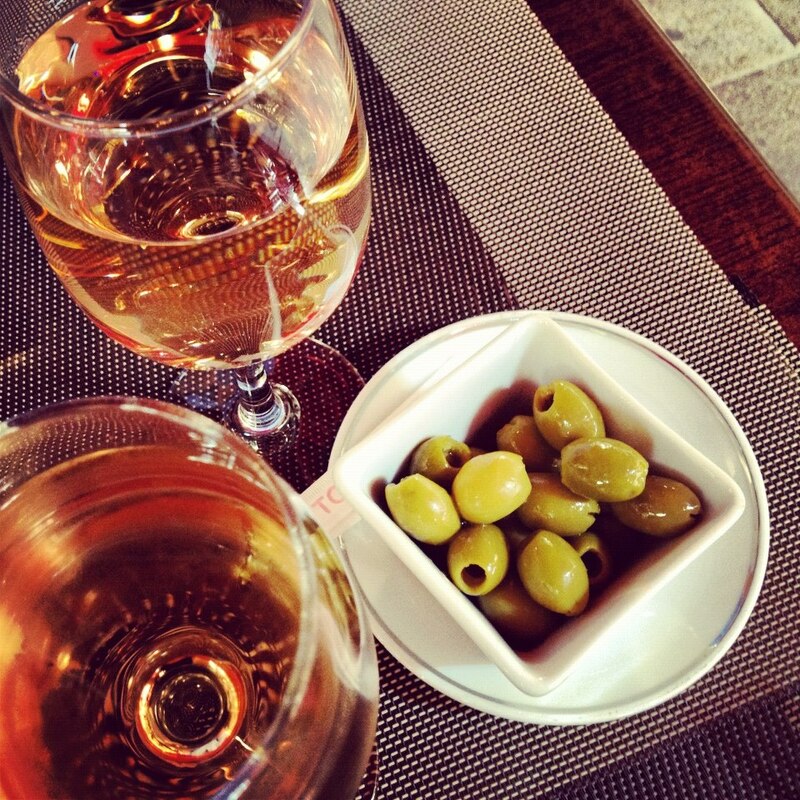 We started this meal as we often did on our honeymoon – with wine and olives! 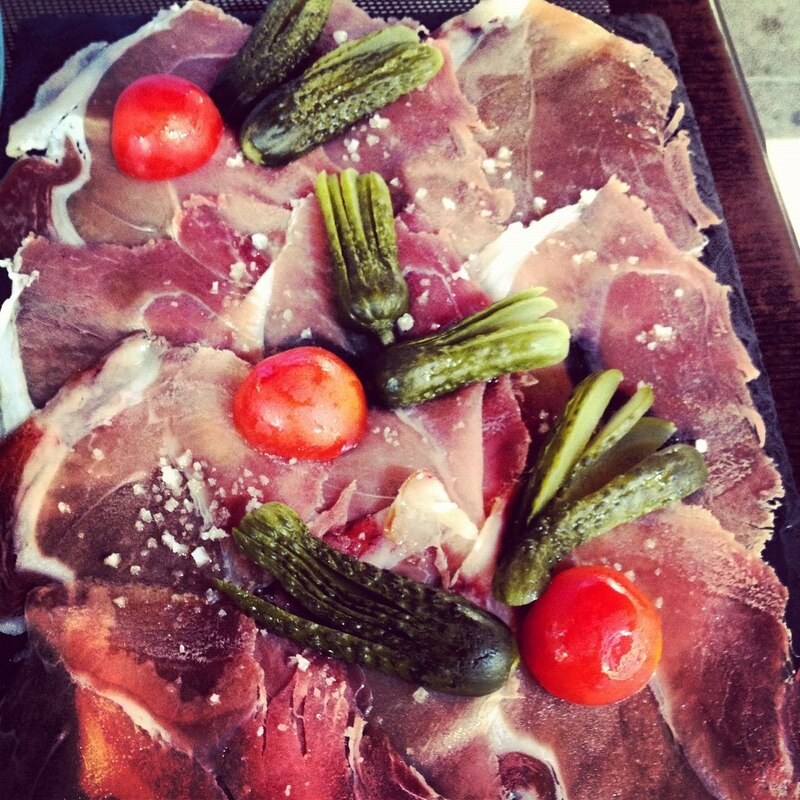 We shared an appetizer of jambon cru (prosciutto- raw, cured ham) that was lightly dusted with sea salt and garnished with cornichons and tomatoes. 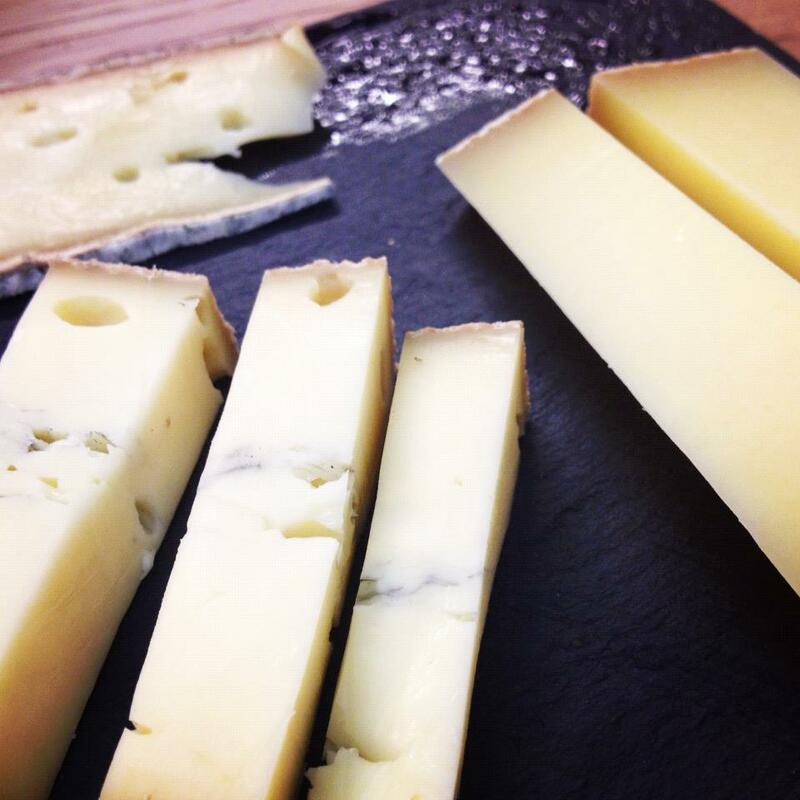 We ate this with freshly baked French bread. 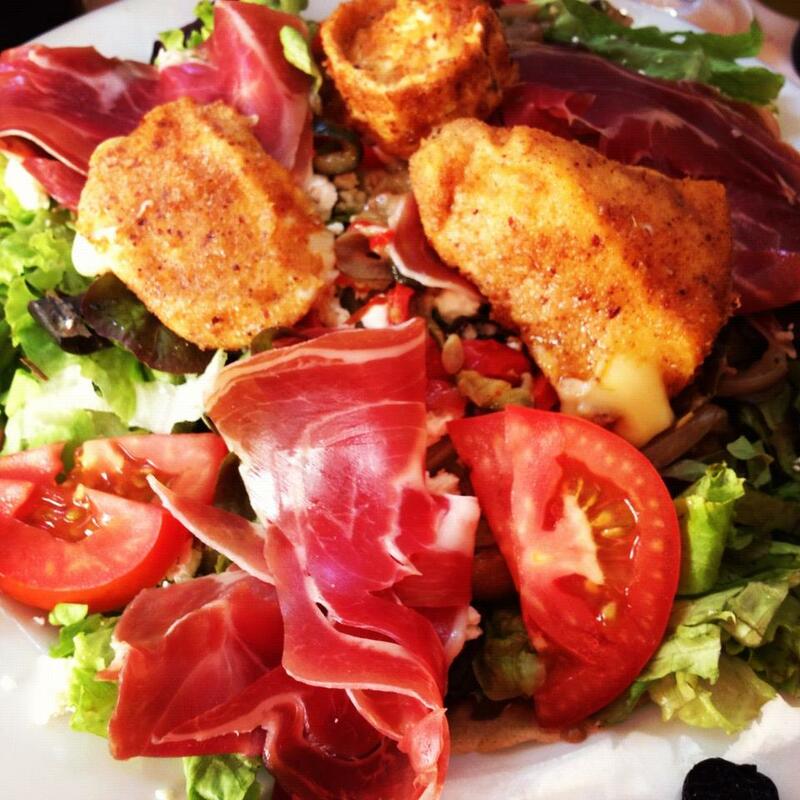 I filled up quite on a bit on this, so I ordered a salade de poulet (salad with chicken) with poached chicken breast, homemade croutons, shaved parmesan and tomatoes in a light citric vinaigrette. 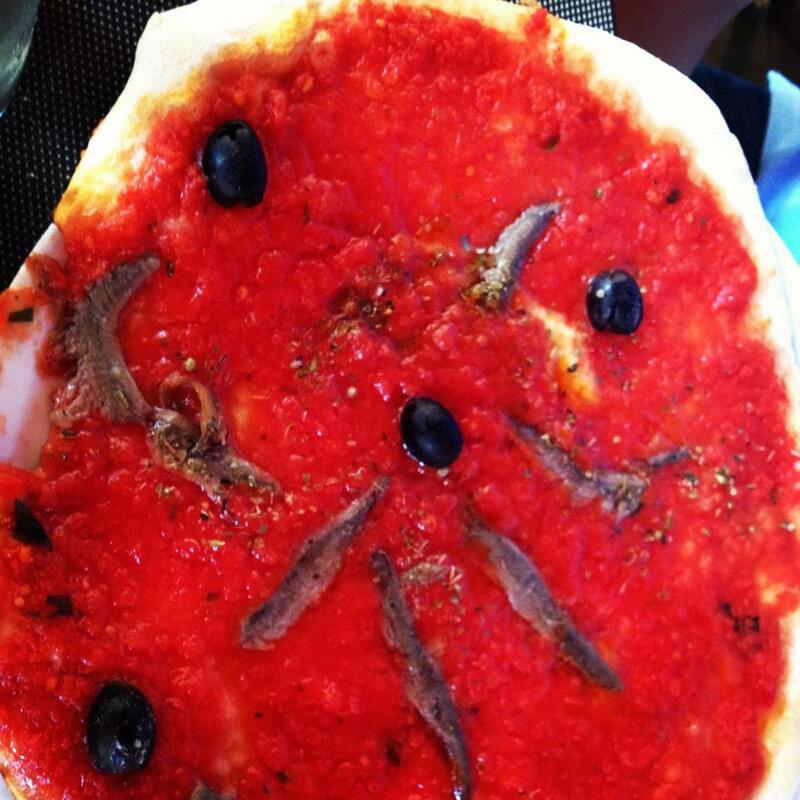 Gareth ordered a pizza with tomato sauce, anchovies and olives. As you can see, this pizza had no cheese, which really allowed the flavor of the tomatoes to come through. Gareth even declared this the best thin crust pizza he’s ever had! 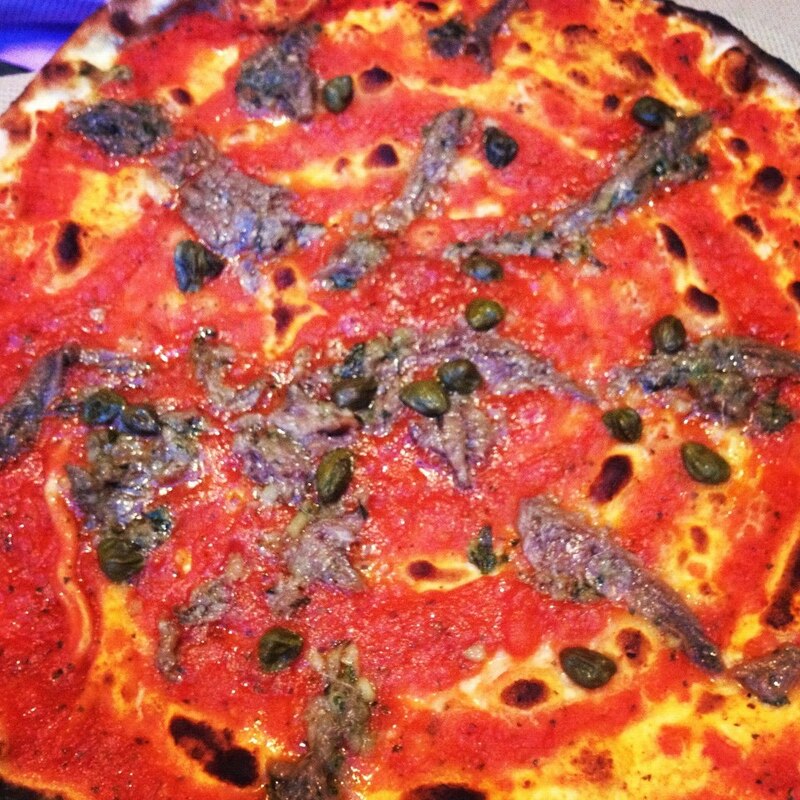 Gareth was on a pizza kick, so he ordered this onion, olive and anchovy pizza. 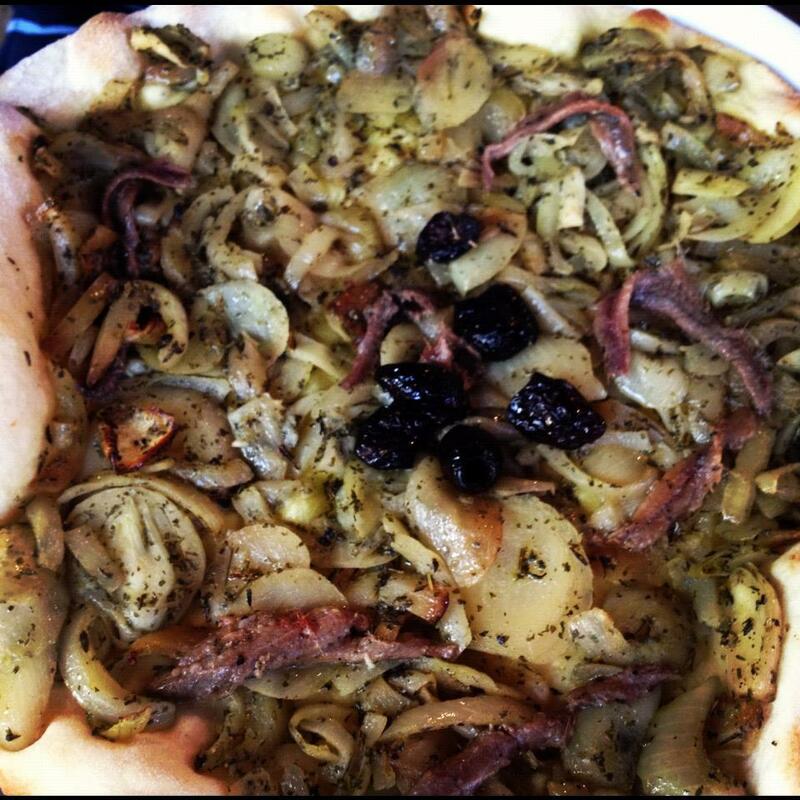 The pizza had no sauce or cheese, but the onions were smothered with fragrant herbs which gave it a lot of flavor. He really enjoyed this pizza, but I can’t say that I enjoyed his breath afterwards! 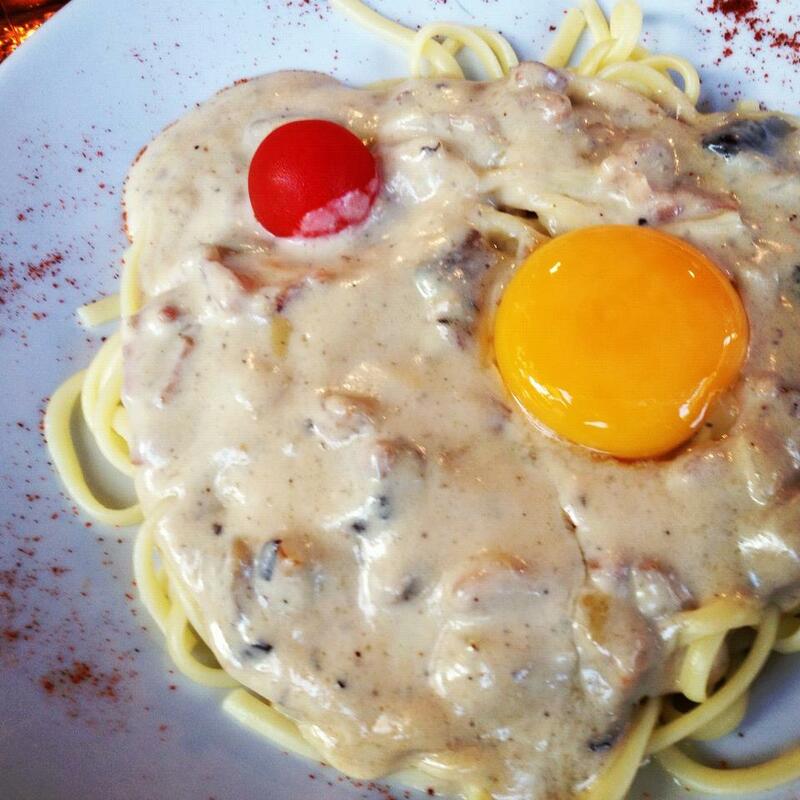 I ordered spaghetti carbonara which has a mushroom cream sauce, bacon and an egg yolk on top. It was creamy and decadent. This meal was a BIG splurge for me. This creperie had a lengthy menu with every crepe combination imaginable. They even had crepes with salad on top, which is what Gareth and I went for. 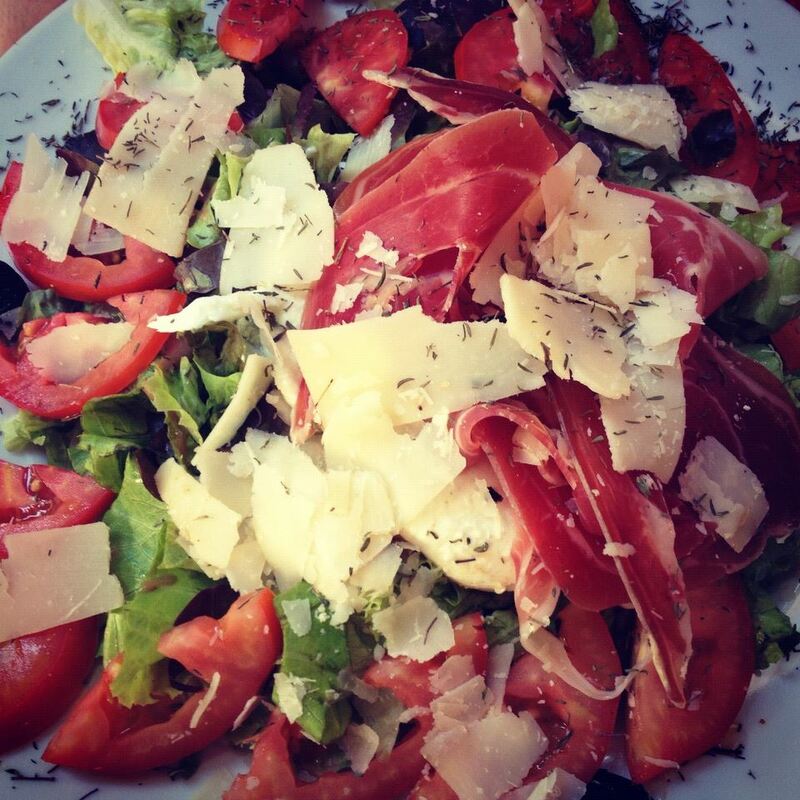 Our crepes were topped with mixed greens, vegetables, jambon cru, cheeses and herbs. They were delicious and filling. This night became what I like to refer to as “the night of gluttony.” We started off our evening with some wine at a pub called Tabac le Gaulois. The pub is positioned right under an old, beautiful building. With a nice buzz, we went on to get dinner at Bella Napoli and got yet another bottle of wine. Gareth ordered an anchovy pizzas (go figure.) 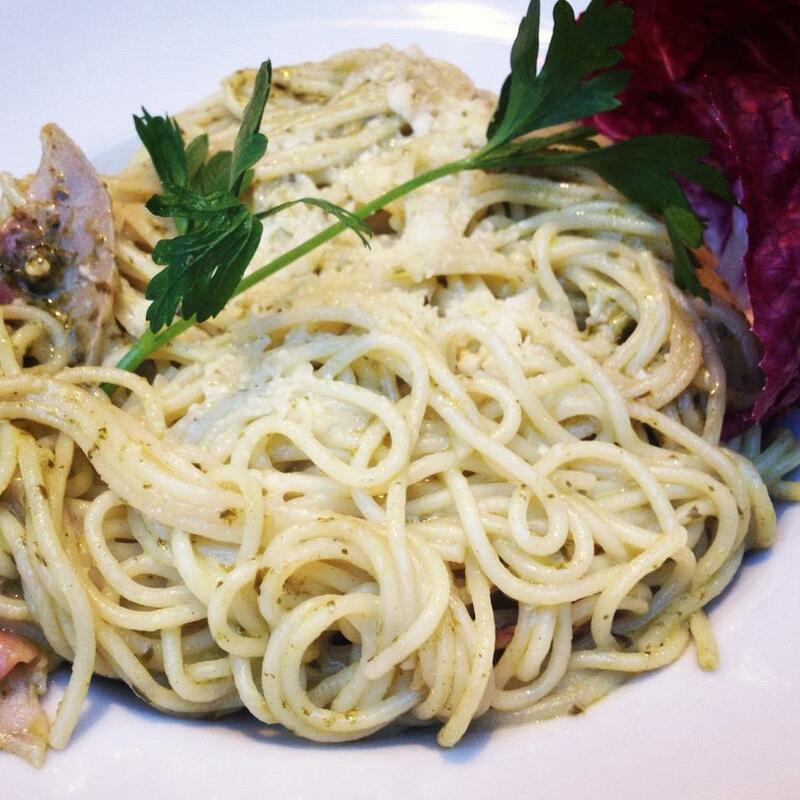 I ordered spaghetti with pesto, pancetta and parmesan. After chowing down on the delicious food, I then had the brilliant idea of getting gelato for dessert. Needless to say, we ate and drank massive amounts… and it was a blast. Per usual, Gareth ordered a pizza for dinner. 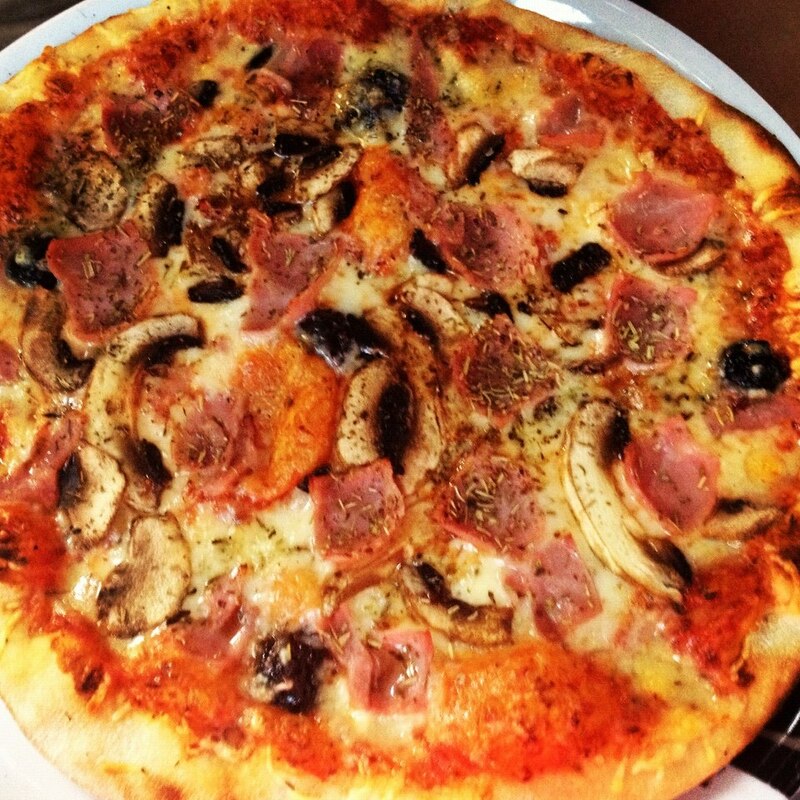 He skipped the anchovies this time and had a Pizza Royale that was topped with olives, mushrooms, ham, cheese and herbs. 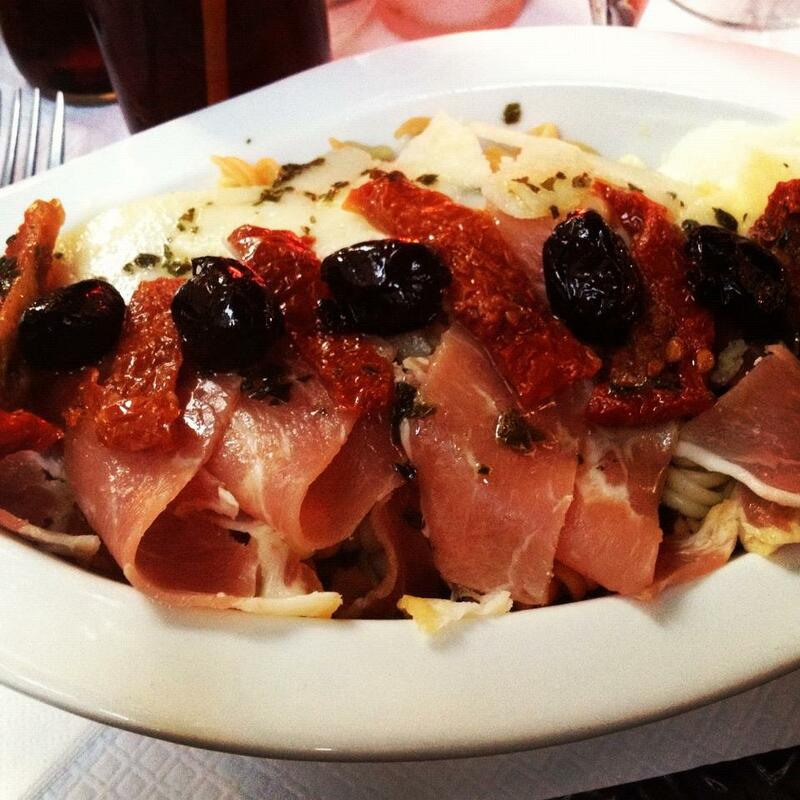 I enjoyed a delicious pasta salad topped with cured olives and sun-dried tomatoes. 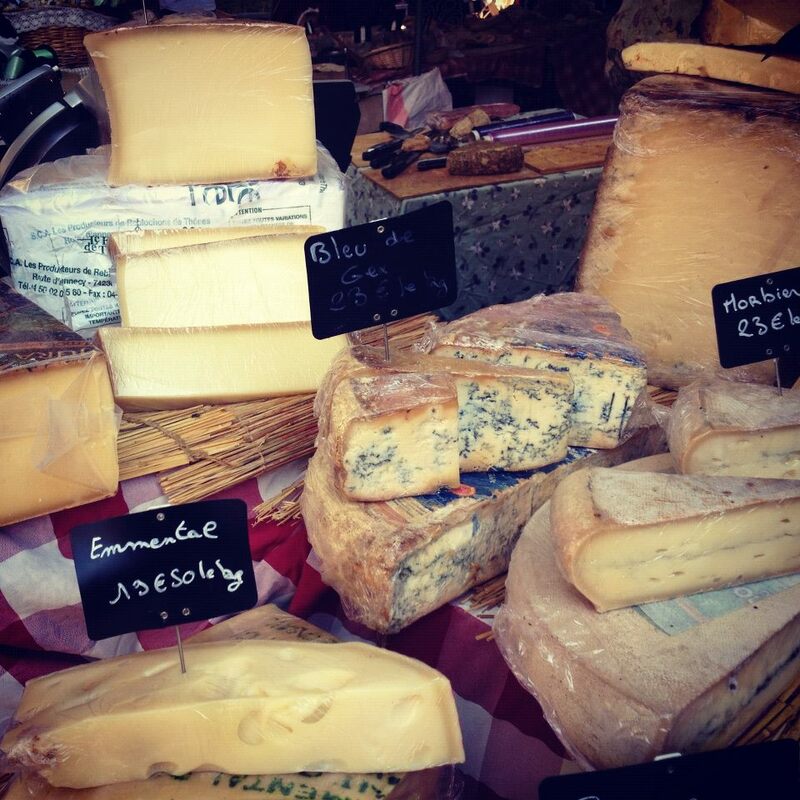 We stumbled across this fromagerie and we had to go in to sample some cheeses. We chose the chef’s platter, which featured several cheeses of the chef’s choice. 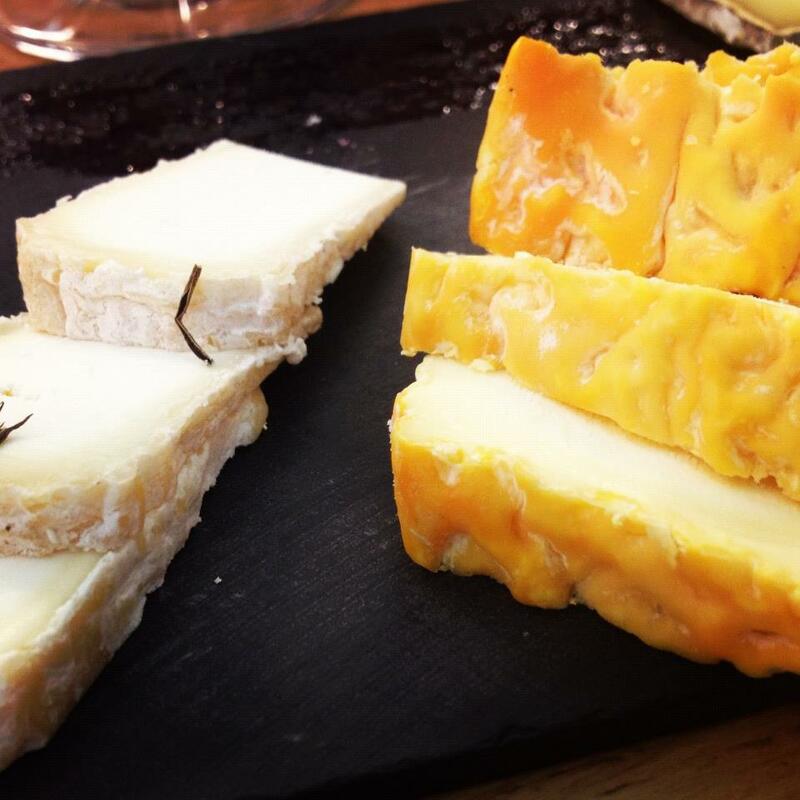 The cheeses were unlike any I’ve ever had before and were aromatic, potent and flavorful. Opened in 1840, this famous brasserie was frequented by many famous and historical figures including Paul Cezanne, Emile Zola, Pablo Picasso and Winston Churchill. We wanted to experience this historical site for ourselves so we decided to enjoy some wine there. It’s a fun and lively environment with great people watching. 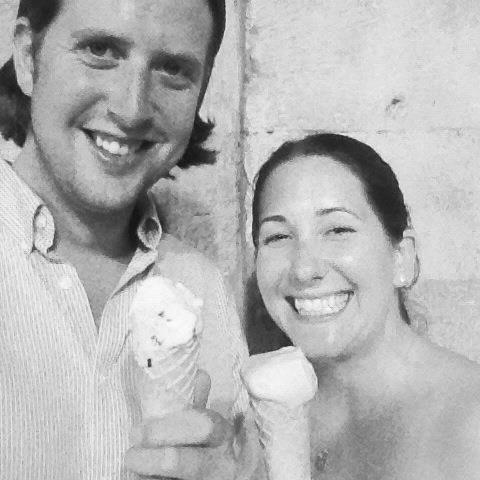 ← Honeymoon Part 4: Geneva.